KIA’s has introduced a new 5-year / Unlimited Mileage Warranty for its full range of passenger models, as well as K-Series light commercial vehicles. KIA’s has now introduced a new 5-year / Unlimited Mileage Warranty which applies to all new Kia models purchased from 1 June 2016. 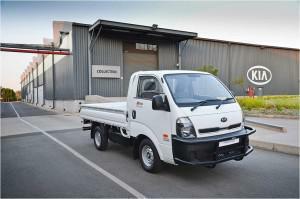 This includes its full range of passenger models, as well as K-Series light commercial vehicles. The best things in life know no limits. This is why Kia strives to be the best it can be every day, and why it puts so much focus into design, engineering and production. The new Unlimited Mileage warranty not only brings customers extra peace of mind throughout their ownership experience, but is also testimony to just how much trust and confidence Kia have in its products. The new warranty follows shortly after Hyundai announced a 7-year/200 000km warranty on all of their vehicles earlier in the year. From the award-winning Picanto in the small car segment, to the range-topping Sorento and Grand Sedona – as well as the hardworking K2500 and K2700 light commercials, all new Kia vehicle owners benefit. “The class-leading global quality of our cars have already been firmly established through our exceptional achievements in the J.D. Power Initial Quality Survey, and the new warranty we offer proves just how reliable Kia vehicles are, regardless of how much driving you do,” says David Sieff, Marketing Director for Kia Motors South Africa. The only change to our notable 5-year / 150 000km warranty is the removal of the overall mileage restriction, with no additional inclusions, provisions, limitations or exclusions. The unlimited mileage provision in Kia’s new warranty is especially beneficial to customers who drive longer than average distances over shorter periods, whether it’s due to the nature of their employment, or whether the vehicle is part of a hardworking fleet. More good news for customers is that Kia Motors South Africa has also upgraded their standard Roadside Assistance Programme from 3-years / Unlimited Mileage to 5-years / Unlimited Mileage, adding even more peace of mind to your journey.